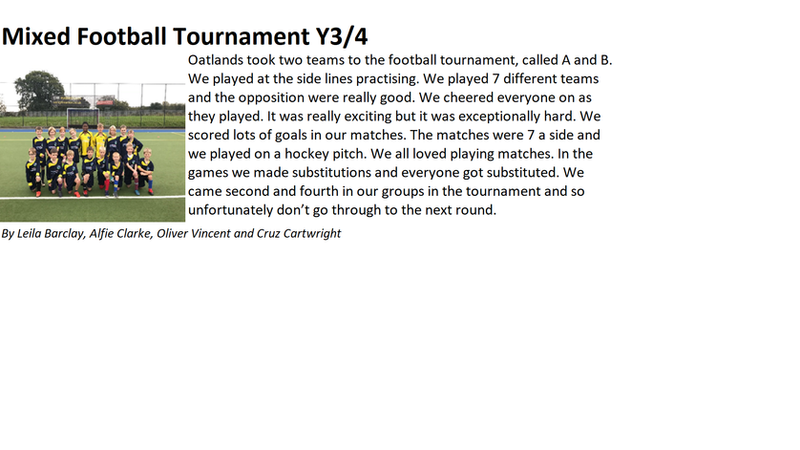 On Tuesday 5th March, some of the children from Year 5 and Year 6 took part in a Hockey Tournament at St Aidan’s. There were 18 teams in total with OJS taking three teams to the tournament. All of the teams played 5 matches each against opposing teams. There were 3 leagues; team A won their league; team B finished in 4th place and team C came 6th. Team A were undefeated and will attend the finals in a few weeks. Well done to all the players and good luck to the A team for the finals! Last Friday, our boys’ football team went to York to play in the National League Cup representing Harrogate Town FC. This followed their success in the Harrogate Area Finals. The team played against the club representatives form Hartlepool, Guiseley, Halifax, Bradford, York and Gateshead football clubs. The standard was high and the pace was quick. Well done to Sam, Lucas, Jamie, Zach, Alfie, Henry, Alasdair and Kuba (who stood in for Ollie at the last minute) for an impressive performance. Sadly, we didn’t make the final this time but not for want of trying! Well done boys – no pressure Y5 but it’d be great to go again next year! On Thursday last week, two teams of children attended a gymnastics competition at Rossett School. They all performed in floor routines, body management routines and a vault routine. Despite some excellent performances, we didn’t make it through to the finals this year. Thank you to Annabel (who was in the winning team last year) and to Ruby and Iona for spending some of their lunch hours coaching – I hope to use you again next year! On Tuesday, 9 pupils from Y3 and Y4 participated in an Athletics Tournament at Harrogate High School. They competed against 11 other Primary Schools in the Harrogate area, in a number of differernt track and field events. I was immensely proud of the team spirit and individual efforts given by all the pupils, each performing at their very best and representing Oatlands Juniors superbly. It was a tough competition and top placings were very close. We came 5th overall out of the 11 teams, which is a great achievement. A huge thank you to Mrs Williams who come along to support and help get the children to each of their events. Well done! On Wednesday 14th of November Oatlands Junior School attended the football finals for both the girls and boys respectively, at Harrogate Town Football club. The girls’ team did really well and were competitive in every match. We hope that reaching the finals will inspire more girls to be part of our school football teams. Well done to Ashton for receiving a special award for determination. The boys (led by Mr Bray) managed to win all their games and won the whole tournament. They received the shield for the Harrogate Schools area and will now represent Harrogate Town in a club tournament. Well done boys and good luck with the next stage! 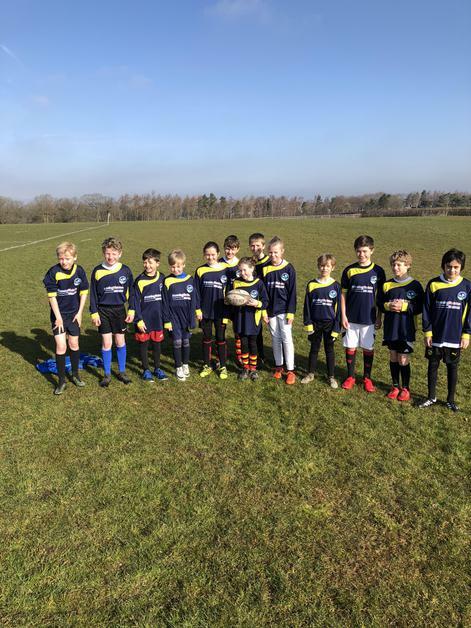 On Monday 5th November, the Year 5 & 6 Football Teams took part in the Harrogate Schools Football Competition at St John Fisher School, entering three teams from Oatlands. Over five games, nine goals were scored with no conceded goals, thanks to the skills of our defence and goal keeper. We played an attacking game with the shape of our team, with many boys scoring goals, our defence was like a brick wall. The attack was fierce and everyone played really well. One team has reached the finals next Wednesday at Harrogate Town Football Club. Our girls' football team have been training during some of their lunchtimes. A big thank you to Finn Poyser-Senior and Finn Swallow who have been helping to referee their training matches and give a little coaching. On Thursday 27th September, 19 children went to the Hydro by coach for a swimming competition. During the competition, there were races for girls and boys in Y3/4 and Y5/6 for backstroke, front crawl and breastroke. Oatlands Juniors came in 8th place out of 16. This was our first time taking part in this particular competition There was a trophy for 1st place and medals for 2nd and 3rd. A huge thank you to Mrs King and Mrs Snodgrass for accompanying us to the swimming gala. On Wednesday the 26 of September, the girls’ football team played in a tournament and got through to the finals. We played 6 matches, swapping the team captain to make it fair and goalie between Elodie, Leila and Ashton. We had a lot of fun practicing and it paid off in the game. Our first football game was against Willow Tree. Millie enjoyed playing attack with Amina and Yasmin playing midfield with Brooke. Six children from Y4 took part in an archery festival and eight from Y5/6 in a cycling festival this week. The Y4s had a chance to try archery and compete in 4 different archery challenges, while Y5/6 competed in cycling races. Five other schools from Harrogate attended the event. Two of our attendees were awarded wristbands – Charlie Chapman-Wilsher for team work and Edward Evans for determination. This Wednesday, Y4, Y5 and Y6 went to a Badminton tournament at Harrogate Racquets Club. We played against two schools: Rossett Acre and Pannal who were very good teams. But we like a challenge so we went in with a positive attitude and took it in our stride. What a fantastic afternoon! Everyone tried their very best. It was tense; we were waiting for the scores and… WE WON! Thank you to Mrs Adrian and Mrs King for helping out with the tournament. We all enjoyed it very much. On Monday 25th June, 12 pupils who attend Rounders Club on Friday afternoons, took part in a tournament at Rossett Sports Centre against twelve other schools. It was a very hot day meaning we had to drink lots of water. We were split into pools of three, in our pool were: Rossett Acre and Follifoot. We played 4 matches and won two of them, both of them against Rossett Acre. In our pool we came second, Follifoot winning. Thank you to Mr McIntyre for taking us. We would recommend that any future Year 5 and 6’s take part. 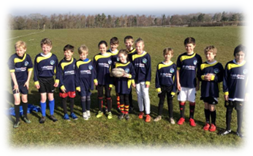 On Thursday 29th March 2018, 10 children from Year 5 and 6 travelled to Harrogate Rugby Club to take part in a Tag Rugby Competition. We played eight teams and went undefeated. We won the tournament using bagel power! Well done to Lucas Moyser, Charlie Whewell, Ollie Holdsworth, Eleanor Robson, Alasdair Davidson, Lucas Harrison, Molly Wainwright, Aimee Suddaby Zach Rawes and Josh Morales-Macias. Schools from all over North Yorkshire descended on Dalby Forest last week for the Level 3 School Games Cross Country Finals. 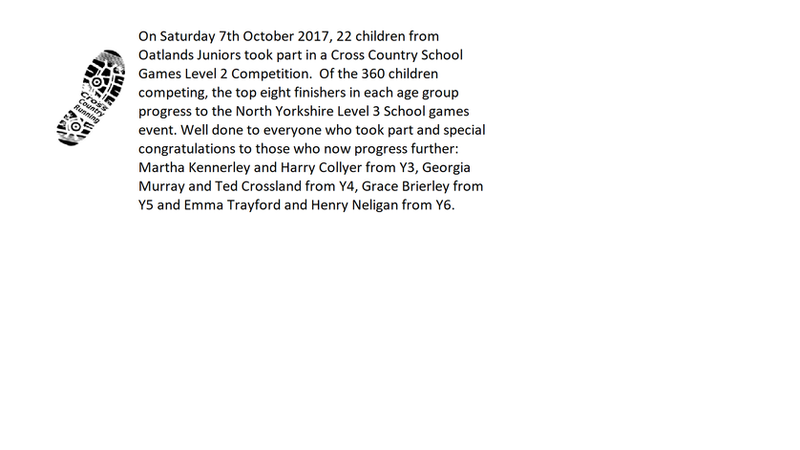 Congratulations to Harry Collyer, Martha Kennerley, Ted Crossland, Georgia Murray, Emma Trayford and Henry Neligan, all of whom not only qualified for the finals but finished in a range of positions from 23rd to 55th. With over 600 primary school competitors in total, they did very well. On Thursday 22nd March, 12 Oatlands Junior School pupils took part in a Quicksticks Hockey Tournament (four players a side) at St. Aidans COE High School. We played four matches against: Sutton, Pannal and Willow Tree, there were eight teams in total, who all played very well. We took three teams, the A team, B team and C team. The A team came 2nd overall, receiving a place in the Final at Harrogate Hockey Club. The B team came 3rd and the C team played very well too. We really enjoyed this Sporting Event as we enjoyed representing our School and working in a team. Mr McIntyre gave Elsa player of the tournament. On Thursday the 22nd of February we went to Harrogate high for the gym finals. When we got there we went to floor warm up. On floor warm up we practiced very hard on the routine, and our smiles. After working very hard we went to compete in floor. We thought we were going in a bad direction until the judge smiled at us. After doing an incredible floor routine we headed to vault and had our two practices. We all remembered to do a tuck jump instead of a summer jump. Yeh we did great in vault! Body management was are strongest event but our scariest event there. We came the fifth best in North Yorkshire. 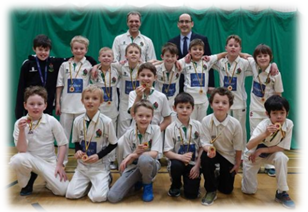 A huge well done to Harrogate U9’s Cricket team, whose indoor team recently topped the league table by winning all seven of their games. Oatland Year 4s, Ted Crossland, Joseph Kell, Rafi Leslie, Joe Kinnear and Ben Summerson all play for the U9s. The squad, which practices at Ashville Sports Centre, were presented with their medals by Stowe Family Law CEO Charles Hartwell, at a ceremony attended by parents. Their final game is a play-off against the team in second place, Studley Royal. We wish the team the very best of luck! We went to a Y3-4 gym competition at 3:15pm on Thursday 1st February at Rossett sport centre. The schools competing were Pannal, Rossett Acre, St. Peters and us. Our team consisted of Iona, Yasmin, Ruby, India and Annabel. All of us were very nervous but excited at the same time. We were the first contestants there, so we got the best seats. Our first event was floor and we did it very well. Some of us were a little hesitant at first but we got the hang of it in the end. We also forgot to smile at times, because we were so serious about winning! Then we headed towards vault. We all managed to do the high vault but the other team didn’t. Body management was our strongest event but we also liked it because it had skipping and we all like skipping! After that we were very tired, so we all got our snacks and drinks out and had a little rest. This is the time we had all been waiting for… The top two got into the finals and WE CAME FIRST! Five girls, year 3/4’s, entered into the Harrogate and Craven Gymnastics and came out as winners. It was an incredibly tight competition, with Oatlands winning by 0.9 of a point. The Oatlands girls performed a floor routine, body management and vaulting: they showed control, athleticism and determination, to remember their routines and perform them at such a high standard. The girls will be back to hard work as they have progressed onto Harrogate Finals on Thursday 22nd February. Well done girls on such a great achievement!